"The design of the Monitor SUB 12 can accurately be described as minimalist, which is good for getting it past a discerning wife. This said, the grille is removable. The Monitor SUB 12 looks much more menacing without it, thanks to those corrugated surrounds on the cone." "...the effects of the Perfect Bass Kit were immediately noticeable, mainly in that the Monitor SUB 12 was now more of an integrated piece of the system and drew less attention to itself. The bass was more precise and natural, exactly how you want it to be, especially when your goal with music reproduction is transparency." "...the Monitor SUB 12 was more sophisticated, for lack of a better word, than many of the other subs I've heard in this price range. This is a testament not only to the engineering of the Monitor SUB 12, but also the equalization/optimization offered by the PBK... most of Paradigm's competitors in this range don't offer this sort of sophisticated room correction system...the Perfect Bass Kit is well worth the price, especially if your room is acoustically messy." "The Monitor SUB 12 came alive and blended seamlessly with the rest of the speakers in my system. The bass was powerful without being overbearing and brought quite a bit of depth." "...the Monitor SUB 12 shone. It provided punishing, room-filling bass in a room that's over 350 square feet. I had actually watched this film prior to using the Perfect Bass Kit and found the bass to be a bit looser and less focused. With the PBK engaged, the bass was a tighter, more fully realized part of the presentation and showed no signs of bloat." "I really got a dose of those Santoprene surrounds, as the Monitor SUB 12 was deftly moving big time air and I could feel it pounding in my chest, much the same way you do at a bass-heavy live concert." "The experience was visceral and I ended up playing this chapter back for a few friends, so they could experience what well-engineered, chest-rattling bass sounds like. This elicited plenty of dropped jaws and comments about the experience." "Setting up the PT-2 was an absolute breeze. You simply connect the transmitter to your processor, plug it in and then press the button to sync it with the sub - it's really that simple." "I can certainly envision a husband using it to get spousal approval for adding a subwoofer to his system, due to the fact that you can hide it. I can also see it coming in handy in a dual-subwoofer home theater configuration, allowing you to place each sub wherever they compliment each other the best." "Despite a major volume push, the bass remained taut and compelling, providing an incredibly immersive experience. Films like this demand subs with substantial drivers, powerful amps and solid engineering; Paradigm delivers all three in spades... I never encountered any drops or dips in performance with the sub connected wirelessly." "Though the Monitor SUB 12 is an exemplary subwoofer on its own, mating it with the Perfect Bass Kit and taking the time to get everything just right is what makes it a game-changer at this price point. I can't say that I've heard other bass this powerful and low-reaching for under a grand." 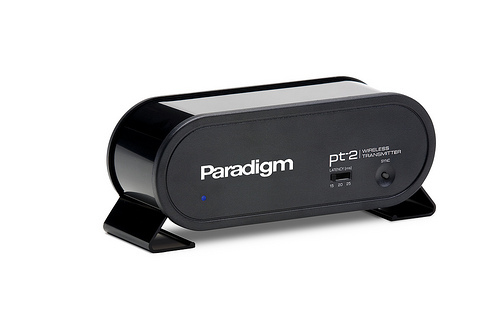 "The engineers at Paradigm have created something special with the Monitor SUB 12. While I consider its true strength to lay in recreating explosions, gun play and all the other sonic treats a good action film can deliver, it can also adequately service your music collection with taut, highly-resolved bass." "The bottom line is that the Monitor SUB 12 hits hard, really hard ... but does it in a refined way... The Monitor SUB 12 is a shining example of that type of bridge product, as it provides an affordable, immersive home theater experience that is really difficult to beat at this price point." At 4.5 stars, we think we hit a home run! Click here! to read the full review. Click here! for more info. on the Monitor SUB 12.